I am creating a NuttX device driver for Melexis MLX90614 and it is a nice adventure. First I downloaded the adafruit lib and tested it on Arduino Uno just to confirm the sensor was working, but I didn’t look the source code because I always prefer to read the datasheet and implement the driver from scratch. All things fine, the mlxtest example worked correctly and I got the ambient temperature and the object temperature printed correctly. Very good! But how to check if CRC-8 PEC field (third received byte: 0xCF) is correct? What this guy is saying is: we need to include all the bits of the Slave Address, the address needs to be seen as 8-bit including the the less significant bit Write or Read. 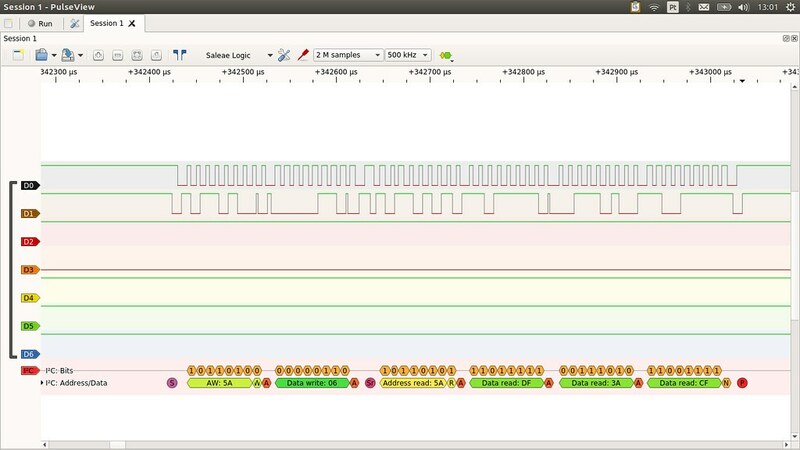 So I2C Write at address 0x5A is seen as 0xB4 and I2C Read is seen as 0xB5 (pay attention at bits over the “5A” in the logic analyzer image above).